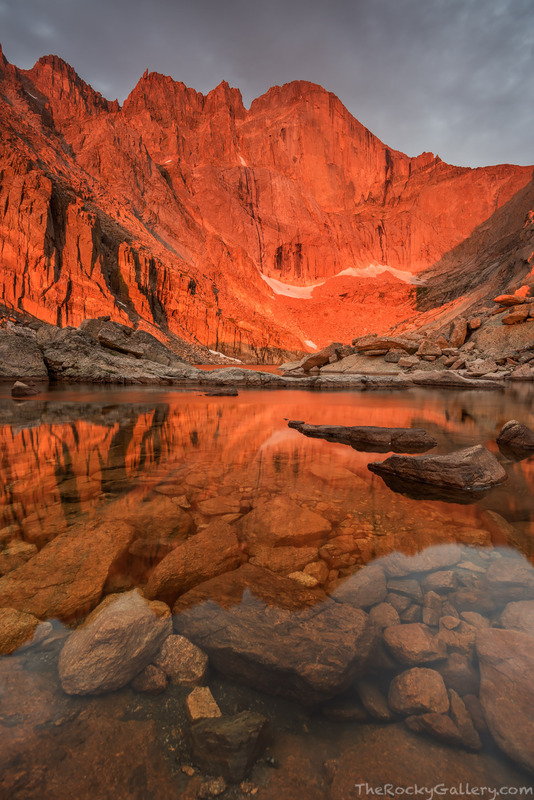 I've visted Chasm Lake at the base of Longs Peak many times over the years to photograph it. Longs Peak and its northeast facing Diamond formation get some of the best light for photography at sunrise in all of Rocky Mountain National Park. Rising over 2000 ft from the base of Chasm Lake The Diamond is both dramatic and a scenic icon of RMNP. Getting the weather conditions to cooperate at Chasm Lake can be a challange. High winds and many clear mornings make getting clouds combined with a mirror like reflection difficult. This morning I was blessed enough to have both dramatic storm clouds over Longs Peak, while Chasm Lake remained still. So still was Chasm Lake that you can even see the rocks under the surface of this location at the base of Rocky Mountain National Park's highest peak. Photo © copyright by Thomas Mangan.